With the Indian government opening up its defence sector to private players, the Reliance ADAG group-owned Pipavav shipyard in Gujarat is where several ‘Talwar’ class frigates (the Russian Project 11345) will be built with Russian collaboration, a newspaper reported. The Russian military establishment has chosen an Indian shipyard to partner it in production of Project 11345 frigates, the newspaper Economic Times reported on Thursday. The Pipavav Shipyard, owned by the Reliance ADAG Group of Indian billionaire Anil Ambani, will be where, according to ET, three to four Talwar-class frigates (Project 11345) will be built for service in the Indian Navy. This order could be worth in excess of $3 billion. Citing official sources, the newspaper said that Russia has informed the Indian Defence Ministry of the fact that it has chosen the Pipavav Shipyards last week. 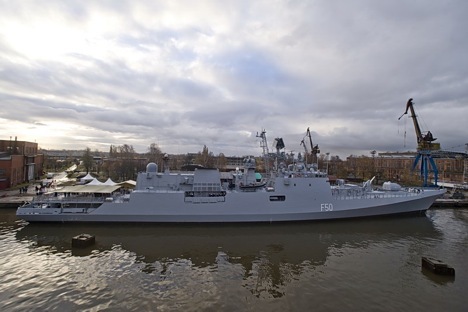 The shipyard received an official letter confirming the partnership from the Director of the Federal Service for Military-Technical Cooperation (FSMTC), Alexander Fomin. The contract for the construction of the frigates will be awarded in the form of an intergovernmental agreement, and could be signed during this fiscal year. The contract to complete the project would be for a period of six to eight years. Vice-Admiral P. Murugesan, Deputy Chief of Staff of the Indian Navy, said earlier this week that India was holding discussions with Russia on the possible production of Project 11356 ships, within the framework of the “Make in India” Programme. Between 2003 and 2013, Russia delivered six Project 11356 frigates to India. These were built at the Baltic Shipyard in St. Petersburg and the Yantar Plant in Kaliningrad. The first three ships are armed with the Russian-built Klub-N cruise missiles, while the second three frigates carry the BrahMos cruise missiles, jointly built by Russia and India. The Indian armed forces started to receive the BrahMos supersonic cruise missiles in 2005. This missile has a range of 290 kilometers and is capable of carrying a warhead weighing up to 300 kilograms. Project 11356 patrol ships are designed to carry out combat operations against surface ships and submarines, while fighting off any attacks from the air – independently or as part of a combined force. They are equipped with universal missiles and artillery weapons, as well as modern radar facilities for anti-submarine and air defence operations. Ships in this series have a displacement of about 4,000 tons, are 125 meters long, and can achieve a maximum speed of 30 knots. The vessel can carry a crew of 180 personnel.